Bozeman has been an important place in the past for us as it was there over 12 years ago when we found out that we were going to have our first child, Jacob. It was then that Michelle and I enjoyed a winter visit down to Yellowstone with our Bozeman friends and were lucky enough to see a wolf pack not too far off the road with a fresh winter kill. It was a wild, wild scene extenuated by the whiteness of winter, the reality of life in the wild hit hard with the red blood of the elk coloring the entire wolf camp. The landscape so cold and wild I felt almost embarrassed to be an observer. Our friends are no longer there but the idea of visiting for a bit was enticing. In practice we found that resupplying and moving on as quickly and efficiently as possible was by far the best thing to do for our motley little crew. With full rations we headed south through Galletin Canyon to the west entrance of Yellowstone National Park. Yellowstone is the first National Park in the world. At 3,468 square miles it is a huge land area and with just about all large Rocky Mountain animals present and heavily protected or even re-introduced it has become the top animal viewing National Park or the “Serengeti” of North America. 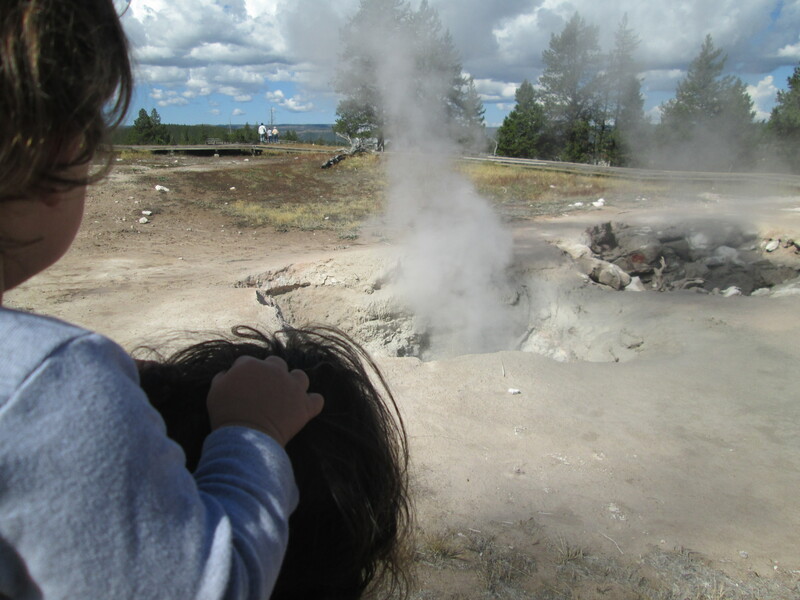 This area was originally set aside because of the geysers and massive hot springs spread all over the park. 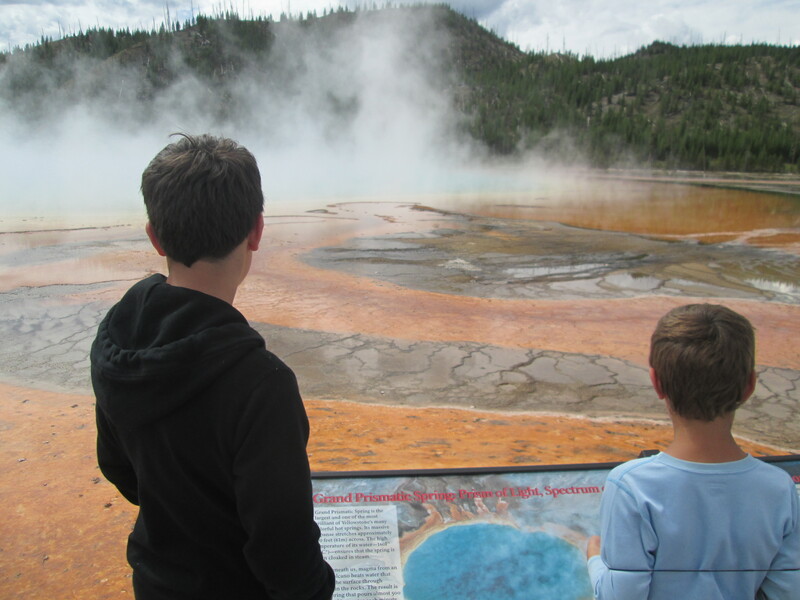 The park averages 7,000 – 8,000 foot elevation and holds the most geyser and hot spring activity in the world and is in fact now considered the worlds largest super-volcano. Some geologists believe that it is in fact due for an eruption at any time that could destroy almost all life in North America. We pulled into the west entrance of Yellowstone around 7 in the evening. After a few miles of driving we ran into the first of the classic Yellowstone animal viewing car scene with a traffic jam of people franticly stopping in the middle of the road and getting out with giant cameras to photograph the unnaturally tame Elk heard bimbling about. This brought me back to another memory of Yellowstone. When I was about 18 or so I was traveling through Yellowstone with a group of friends when uncontrollable sulphuric belches and farts billowed from me as we were entering the park in a jam packed Astro Van. 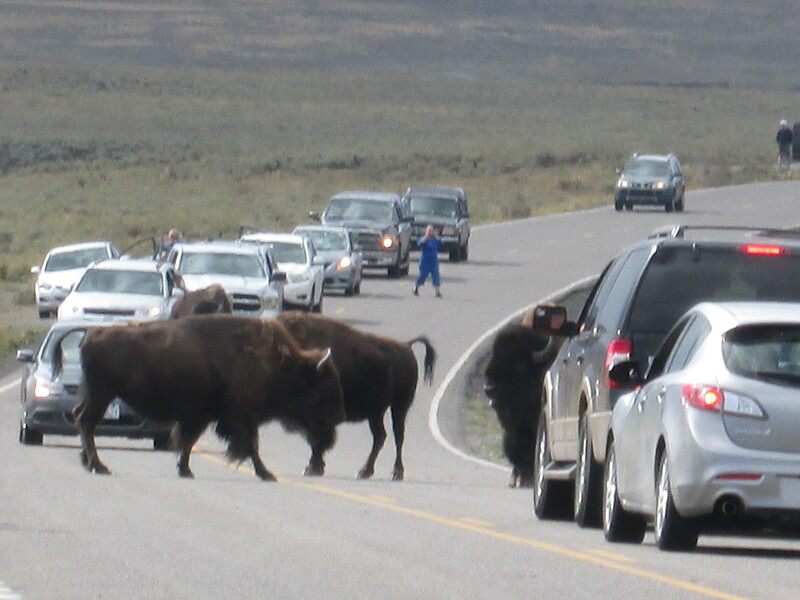 Eventually I had to hop out and my quickly on setting Giardia took a tight hold of my facilities and there I was on the side of the road in Yellowstone……Gone Wild. The cars piled up to take pictures of the man loosing it from both ends. Onward to our campsite we were jammed into the tightest most expensive camp of our journey to date which was odd compared to the amount of wild area surrounded the campground. We quickly set up and off we were to the spectacular upper Madison River meandering just out of camp. Fishing rods in hand we decompressed on the river for the rest of the evening. 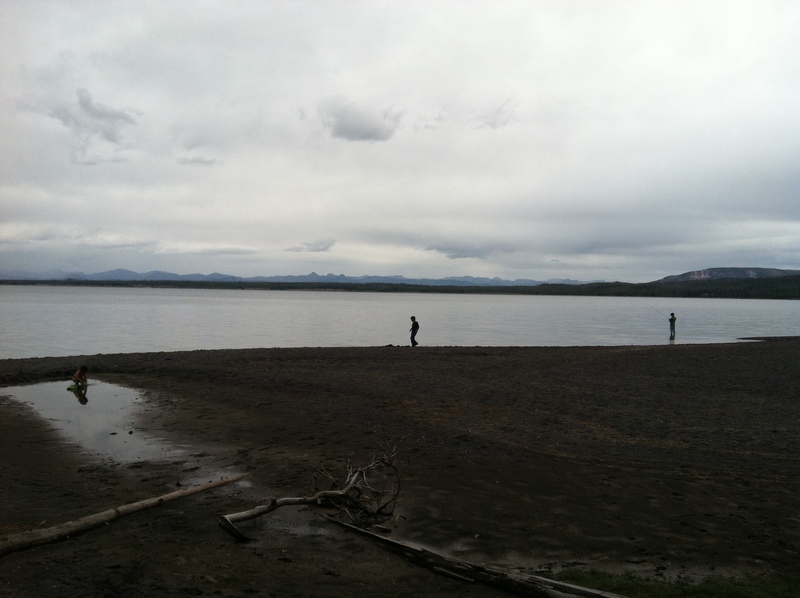 The next day we packed up and headed down the road towards the south end of Yellowstone Lake. The section of road between was within the great Caldera which is the center of hot spring and geyser activity in the park. 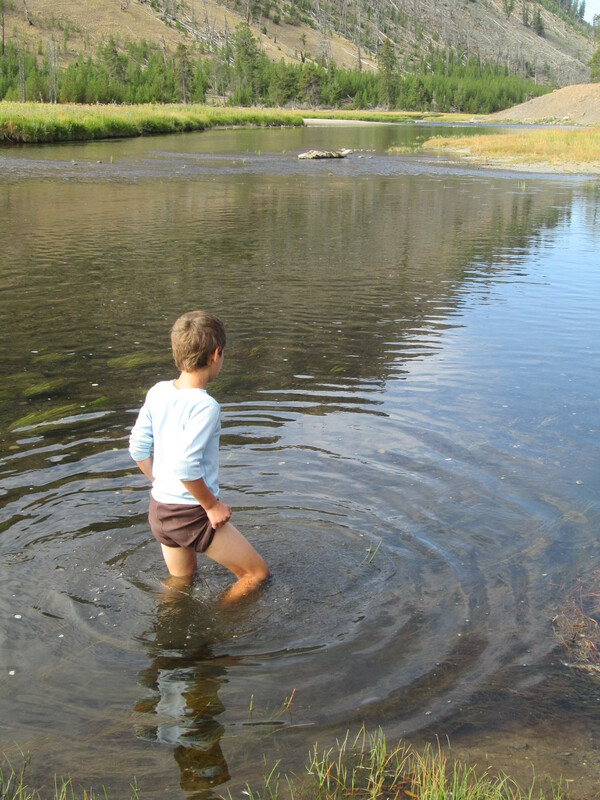 Our son Elias, the naturalist/scientist of the family was beside himself running along the boardwalks that trailed the hot spots, oozing mudpots colored rust, golden, greens and blue from iron blue, spouting steam and water geysers. The following day we headed into the valleys to the North of Yellowstone Lake where we had a blast. 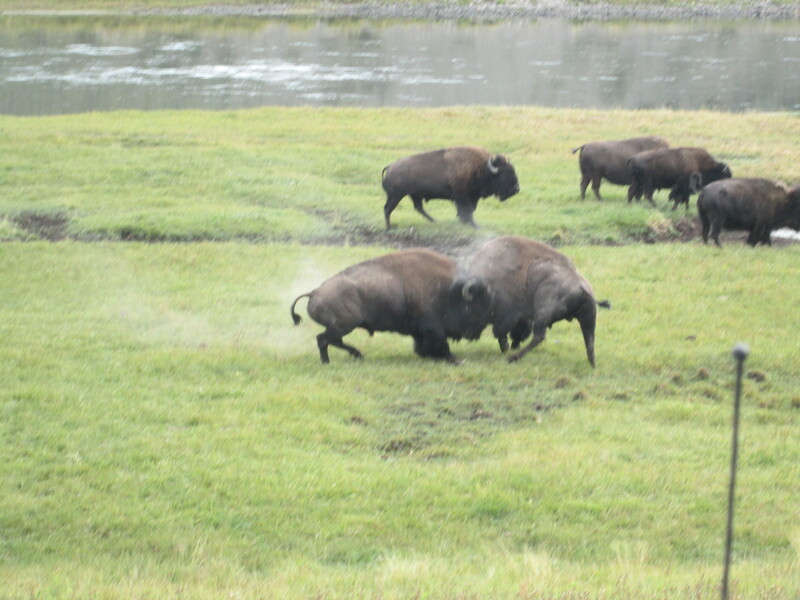 As we drove through the herds of Buffalo the memories of my first visit to Yellowstone came flooding in. I was 16 the first time that I ever saw the Rocky Mountains. A family road trip brought us clear up to Fargo North Dakota to join up with my Aunt and Uncle and cousins. We drove across the Plains via Billings and drove in through the Bear Tooth Mountains. I had spent time in the Alps which did not prepare me for this level of Wildness. Driving up over the highest continual road in the states and into Yellowstone’s Lamar Valley is living proof of our countries great ability to maintain and preserve the mountains (even in modern consumptive America) allowing nature to continue to exist and flourish on some sort of modern compromise. On this day as we drove north with my family I cast aside all personal embarrassments about nature as a source of entertainment and jumped in full heartedly. The Bison did not disappoint and the kids were psyched! They were everywhere and we had so much fun. There were ample opportunities to create a strong learning environment about the animals the history and the landscape. While in Yellowstone, we took well advantage of quite a few “adventure schooling” opportunities including the evening presentations by resident rangers on many park subjects on Wolves, Bear and Moose. The boys participated in the Junior Ranger Program and earned their 3rd or 4th badge of the trip. 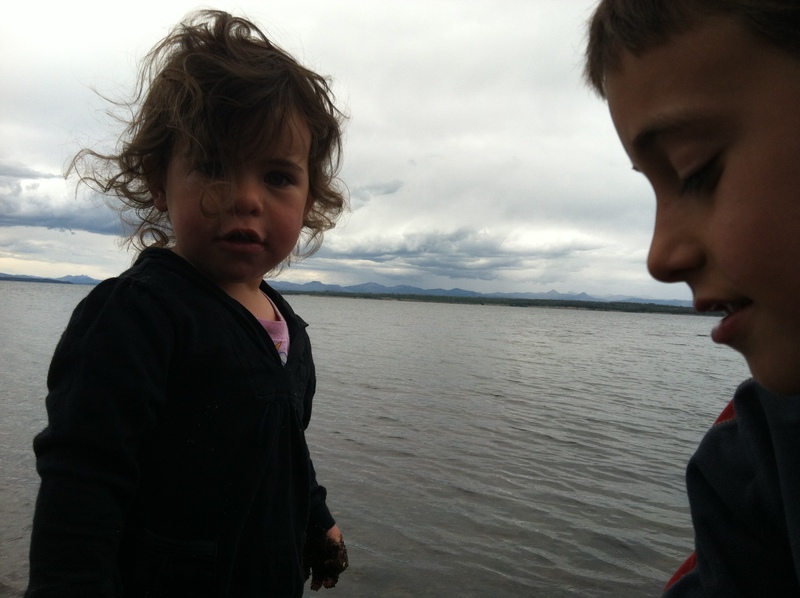 The evening before leaving we were soaking in a quiet evening on Yellowstone Lake each child happily doing their thing. Jacob fishing, Elias making sand castles and Ila…..playing in the pools adjacent to the Lake. Later when we got back to camp we found a leach on Ila’s foot. With further inspection we experienced a panic when we found many more on her body. I immediately went to the visitor’s center and they sent me a few serious looking emergency dispatch rangers who (thankfully) confirmed that the leaches were harmless and to not worry. Alas it was time for us to leave Yellowstone and move south to our next adventure in the Tetons…. We went over Bear Tooth Pass this summer – it was amazing! Lots of marmots, too. 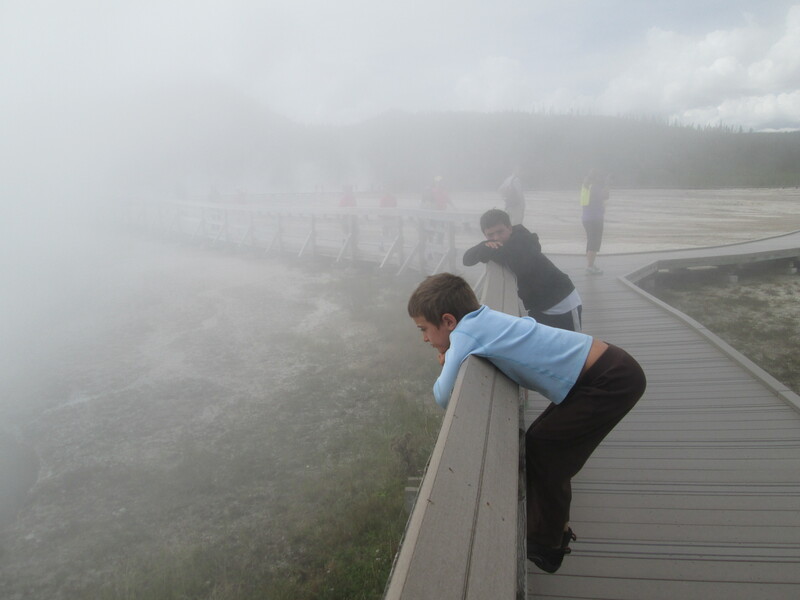 I liked reading your memories of past experiences of Yellowstone woven into your current experience with your family. Artful writing and awesome pics. I can almost smell the sulfur out of the geysers. Loving your posts. Would also love to hear what the kids are thinking of your trip.